This is one of the most popular material types in modern interiors. Sure, gloss is not exactly ‘material’ – it is a special lacquer finish. Most glossy models are made of fine quality MDF. Some rare media storage furniture in modern interiors can also be made of wood. Speaking of glossy finish, the most popular shades are neutral ones – such as white, taupe, and black. However, it is also possible to find less usual colours if you set your mind to it. Even though wood is mostly associated with traditional rooms, there is plenty of wooden media storage furniture that looks relevant in modern environments. Most of these models are made of light wood, such ash or pine. Oak is another popular option. When it comes to wooden units, a lot will depend on their shape. This is one of those rare exceptions, where the design, not the material, determines the style of the model. Glass is becoming increasingly popular in modern environments. Yet, given that it will be a bit challenging to produce an entire model from glass, acryl is often used as a substitution. Even though acryl is a man-made material, it features almost identical ‘glassy’ look, while at the same it features increased durability. This is an incredible option for ultra-modern, hi-tech interiors. Materials, described above, are usually used as dominant ones. Yet, few media storage units are made of one material exclusively – a lot of them feature different combinations, making such models more eye-catching and memorable. High gloss, for example, is typically combined with glass or LED inserts. Diamante inlay is also quite common. Wood can also benefit from a couple of glass inserts – doors, shelves, or simply decorative elements. Sometimes, solid wood is also combined with some glossy elements. 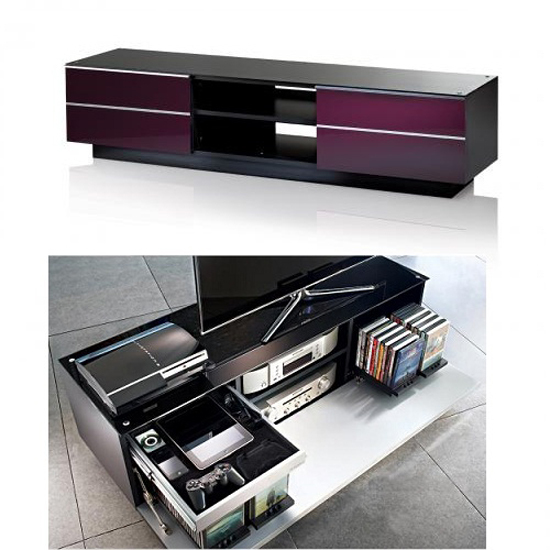 The arrangement is not very widespread, so if you would like to have one of a kind media storage unit, this could be it. Some wooden items are also great in combination with chrome. A gorgeous selection of media storage furniture – modern, traditional, and mixed styled – is available at Furniture in Fashion . So far, this is one of the biggest chains in the United Kingdom, distributing high quality furniture solutions at moderate prices. The store is oriented towards local audience, is operating inside the country, and is delivering compact and medium sized orders within 3-5 business days respectively. In addition, you can always visit their showroom in Farnworth if you would like to check the piece personally before buying. At least 99% of listed products are available in stock and can be examined in a showroom.